It's amazing what the right styling can do for a dress. I first talked about that on this post. But today I have specific photographic examples to prove it! This is my Voodoo Vixen Katnis dress. Every time I wear it, people stop me to see what the pattern is. I always thought from afar that it was mushrooms, because of the spotted umbrella tops. But it's just super cute cats and umbrellas. The first time I wore this dress on the blog is here. Even though I knew it was still too big at the time (I had already sized down), I loved the dress too much to not wear it, and I was worried that sizing down again would mean that it would be too small. All I really needed to do was to put a belt over it to nip in the waist a little more. See in the second pic what a difference it makes? 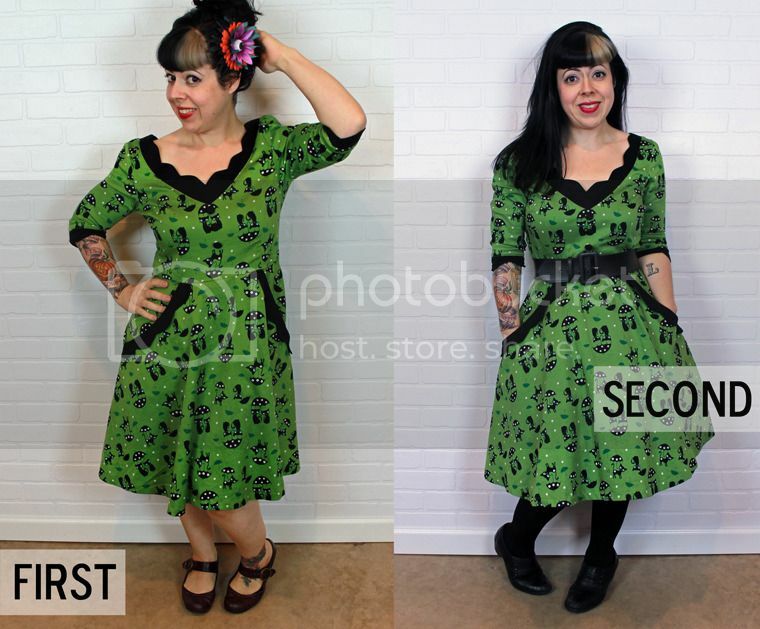 The other helpful styling tip is a petticoat! 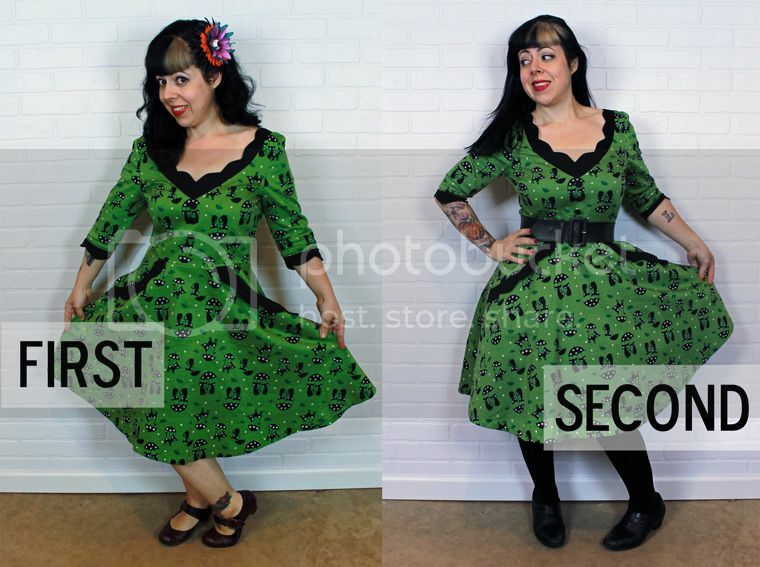 There's no petticoat under the first photo. My waist, hips, and skirt all look kind of the same width. By wearing the belt to bring in the middle, and adding a petticoat to help push out the skirt bottom, I now have contrast between my waist, hips, and skirt hem. Yay! I also like how the belt helps to give the pockets a place to end. Otherwise they just stop kind of weirdly. I never really noticed that until looking at the photos now. This sweater appeared on the blog last summer in my "On Wednesdays We Wear Art" post on Toulouse-Lautrec. 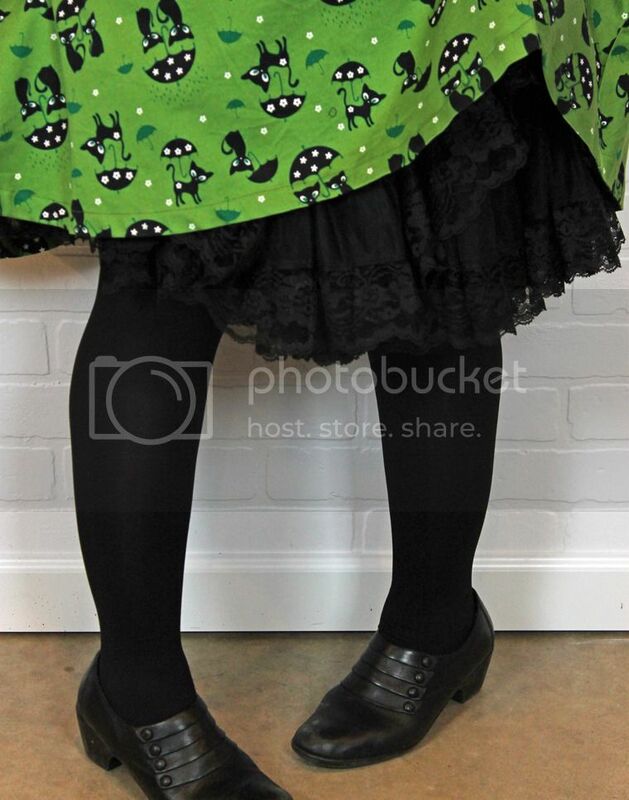 Coincidentally also one of the first times I sported a petticoat out and about. 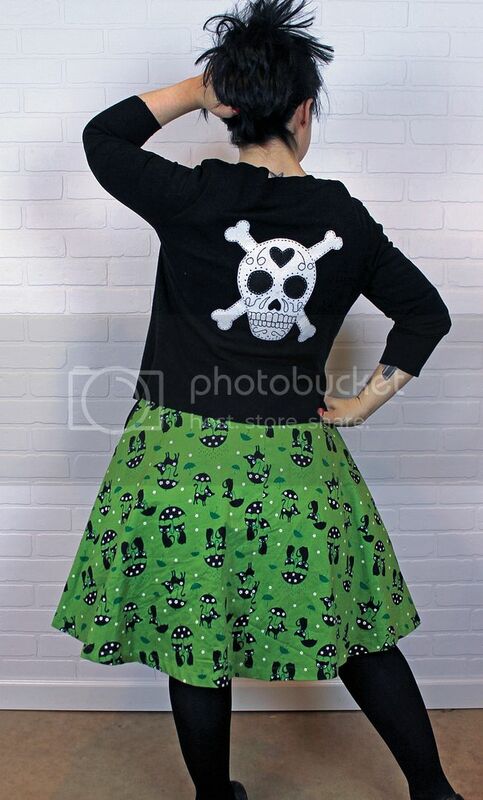 I'm not sure I'll ever get rid of this sweater, I love it so much! 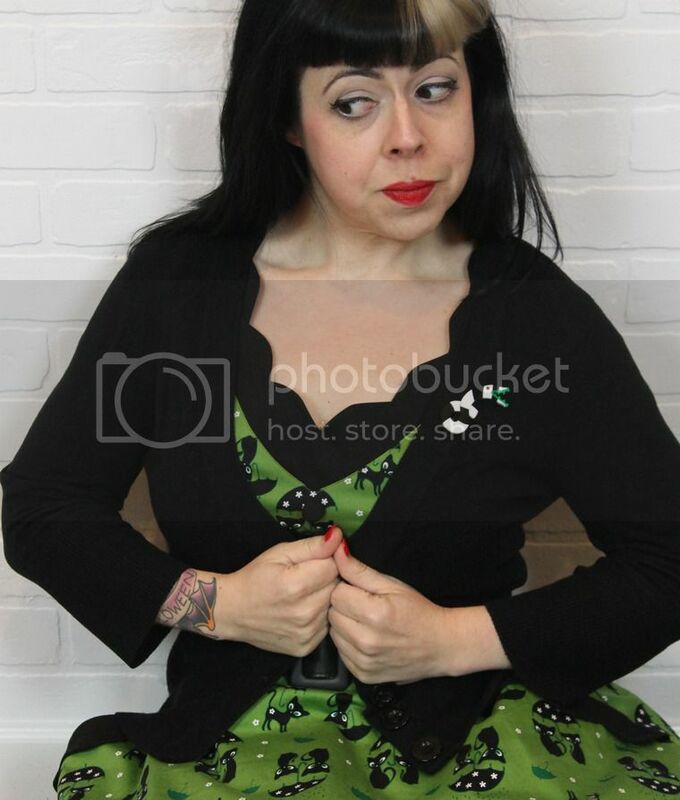 Also perfect for this outfit is my Beetlejuice Sandworm brooch from Heidi and Gretel. :) OMG have you seen that she's making a range of enamel pins? I'm pretty psyched. And also she's designed the new dinosaur range of designs for Erstwilder! Dang! After wearing some "fancier" shoes for a while that are not 100% comfy for all day wear (and then having to skate at night! ), I am loving returning to my comfier styles, like these thrifted Clarks. I'm always looking for comfortable + cute stylish retro options, so please feel free to suggest some shoes below! Thanks!